At Griffith University, the implementation, operation, investigations and related professional development of/for the 2007 edition of the Australian Code for the Responsible Conduct of Research is the responsibility of the Research Ethics & Integrity team in the Office for Research. 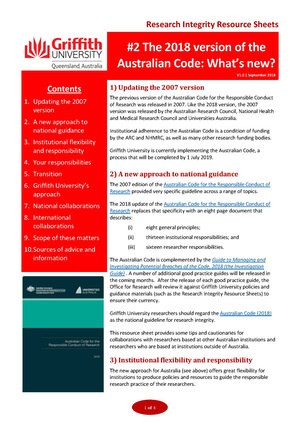 The Griffith University Code for the Responsible Conduct of Research was the University’s policy implementation of the Australian Code (2007) and it was supplemented by the Research Integrity Resource Sheet (RIRS) series. The Griffith University Code was largely a direct repeat of the Australian Code into Griffith University policy. 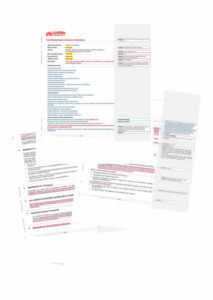 The RIRS is a series of short (most are four pages) guidance documents that provide practical tips related to the University’s implementation of Part A and Part B of Australian Code (2007). This is the first post in the series about institutions implementing the Australian Code (2018). We’d love to hear about your instution’s progress and story. Email us at IntegrityStory@ahrecs.com to discuss logistics. At the outset, Griffith University decided to give its Research Integrity Adviser (RIA) network a more collegiate advisory role, and while RIAs were made available to advise complainants and respondents, or parties in a dispute, their primary role was providing advice and suggestions. Professional development workshops on research integrity for new HDR candidates were conducted a few times a year (as part of the orientation) and were co-facilitated by the Office for Research and the Griffith Graduate Research School. Workshops on research integrity were also conducted for new HDR Supervisors as part of their accreditation. Since 2007, professional development workshops in Schools, Departments, Research Centres, Administrative units and Groups have been co-facilitated by the relevant RIA and a member of the Research Ethics & Integrity team. Griffith University aims to have fully implemented the Australian Code (2018) by the end of March 2019. Griffith’s Research Committee has recommended to the Academic Committee that the redundant detail of the Griffith University Code be replaced by the Griffith University Responsible Conduct of Research policy. 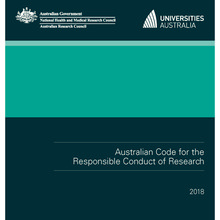 This policy articulates the University’s implementation of the principles and responsibilities of the Australian Code (2018), the role of the University’s collegiate RIAs, and the existence and role of the resource material that will be produced by the Office for Research. Level 1 – Documents that refer to or link to the Australian Code, where a simple change to the reference/URL is required. Example: HDR candidate supervision policy. Level 2 – Documents that derive authority from the Australian Code, where it will need to be determined if the Australian Code (2018) still directly provides that authority or if any changes are required. Example: Publication ethics standards. Level 3 – Documents that copy, refer to or use a component of the Australian Code (2007), where it will need to be determined if the Australian Code (2018) still provides that component or if it needs to be replaced by institutional guidance. The above work is underway and progressing well. In the event new institutional guidance is required, it will be included in the updated RIRS series. Initially any ‘new’ guidance material will use text from Part A of the Australian Code for the Responsible Conduct of Research (2007), but the intention is to refine the material based on (sub)discipline and methodological feedback from the University’s research community, drawing from useful ideas from the Committee on Publication Ethics (COPE), International Committee of Medical Journal Editors (ICMJE), US Office of Research Integrity (ORI) and the UK Research Integrity Office. As new good practice guides are released the relevant RIRS will be reviewed and updated as required. Griffith University is taking a ‘learning institution’ approach to this material, where it is refined and improved over time based on user feedback and suggestions, institutional and (inter)national experience/events and changes in needs. The Office for Research is currently finalising a communication plan, in addition to regular updates to Research Committee, the RIA network and the areas of the University identified for the consultation above. This will include briefings for the Group Research Committees. Early in 2019, the Office for Research and RIAs will commence professional development activities to raise awareness and understanding of the national and international changes. Amanda is happy to be contacted with any questions or suggestions about this work.